Comments: I recreated the simple recipe I recently tried in Dubai (with no bitters) and a lemon peel garnish. It worked well. Comments: Most expensive to date but good. Balanced and not too sweet. No mention of bitters in menu. I recently moved to Singapore which for the most part has been a fantastic experience and a great professional and personal move. However whisky in Singapore is heavily taxed and expensive. How expensive you wonder? Let me put it this way, on the last occasion I purchased a few bottles of my favorite whiskies I soon received two phone calls on my mobile as I was leaving the store. The first was from my bank asking me if I aware that someone had obviously hacked into my account online and was draining all of my cash and savings at an alarming rate. The second call was from the Prime Minister of Singapore thanking me for the contribution I was making to their welfare budget and because of me the hospitals could stay open for another month. He also asked if I knew when I was next going to buy some whisky so they could place an advance order for a new fighter jet. Aside - I have found this great new app on my iphone. Its called "Phone" and everyone who has it has their own unique number (It is usually the same number you use for texting people, I guess that is where they got the idea) and if you enter the number and press send the app connects you to them and you can actually talk to each other. Then a couple of weeks ago I found the Vom Fass store in a mall. Vom Fass sells their own range of liqueurs, oils, vinegars, cognac and of course, whisky. But what makes it such a great place, especially in Singapore, is that they will let you sample anything in the store and sell the range in 100 ml, 250 ml, 500 ml and 750 ml bottles. This means I can try and buy a wide range of whiskies, and recently their 25 year old Armagnac, without spending so much money that even a corrupt FIFA official (that is all of them apparently) at a World Cup venue selection meeting would say “ooh, that’s a bit much”. As I have said before, usually when discussing distillery tours, Seaton’s Success Formula is “Samples = Sales” and the more I have to spend (and in Singapore it is always more) the more I need to be sure I am buying something I will enjoy or at least find interesting (increasingly hard to do now I am 600 whiskies into this website). I will post notes for the first two whiskies shortly and you can expect to see many more, including the Armagnac, over coming weeks and months. Comments: Nice and cold on the larger side. Use of Canadian Club meant it was less sweet than one made with bourbon. Good one. The original Manhattan Project was a research and development project that produced the first nuclear weapons during World War II. 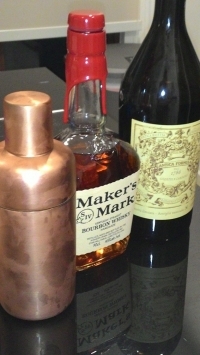 My personal Manhattan project will be slightly less impactful. Probably. As readers know in 2011 I set myself the task of finding and reviewing every whisky in Ian Buxton’s recent books 101 Whiskies to Try Before You Die and 101 World Whiskies to Try Before You Die. I was successful (pausing for gentle round of applause) but it did have a side effect. I know Ian won’t mind me saying that some, while interesting, were not that great and so I frequently found myself with bottles that I did not particularly enjoy. I have enough Scots blood in me to know that I could not see them go to waste so I started to dabble in mixing cocktails and found two that I particularly enjoyed. For unwanted or unloved scotch I would mix Rusty Nails (equal parts Drambuie and Scotch over ice) and for American whiskies, bourbon, rye and Canadian, I started mixing Manhattans. The simple and classic Manhattan recipe is 2 parts whiskey, 1 part sweet vermouth, 2 dash of bitters a garnish (cherry or citrus peel) served usually chilled but occasionally (and as I came to like them best in the Texas summer) over ice. I have the great fortune to travel a lot for my job which means I frequently find myself in airport lounges, hotels and restaurants and often bored to tears by their whisky options I started to order Manhattans (a classic cocktail so there is a variant of it on almost every cocktail menu). And so like the thermonuclear chain reaction that was at heart of original Manhattan project, one passion led to another and now I find myself trying Manhattan’s all around the world. From now on, armed with a trusty camera phone (and probably a little too much jetlag), I will also use my website to track my Manhattan project noting location, price, quality, garnish, recipes and any other tweaks or embellishments of interest. Like the England football team in a World Cup penalty shootout I won’t be trying to score them, I don’t score whiskies either, just sharing my experiences and opinions with all of my readers (if there are any left). You Could Not Make this Stuff Up... The Final word in "Craft"
OK whisky people, regardless of what a Florida judge may say, can we all agree it is now time to take the word "craft" out back and shoot it in the head like a diseased dog as it has become totally meaningless as Pepsi announce launch of their "craft soda". Time to call a good class action attorney? Mmmm a "good class action attorney".... add that to the list of sentences I thought I would never write. At the risk of never getting free samples from Beam and others ever again (oh wait… I never get free samples from Beam or others anyway) I thought I would express my thoughts on current US class action law suits launched against Beam, and many potentially many others, regarding the use of terms like “hand made” and “craft”. To keep this blog brief I will focus the debate around Makers Mark which is one of my favorite bourbons, that way it is clear this entry is not a hidden agenda or “spurned blogger with axe to grind” kind of thing. Also, as a fan of Makers, I have been to their distillery and seen it for myself so I can have an opinion on their production which is harder for me to do with other whiskies and spirits caught up in this. I should also mention that I am a minor shareholder in a small “craft” distillery in London, The London Distillery Company, so I have some experience regarding production in that environment also. Mostly my experience to date involves writing checks to them. (When asked about this investment my usual response is to recall Richard Branson’s line; the fastest way to become a millionaire is to start out as a billionaire and then start an airline. However I am not a lawyer (or a billionaire). I do not understand class actions suits and I don’t understand burden of proof in such cases. This is not a legal discussion but my opinion on what these terms mean and how they are used by this industry. Those being sued, like Beam, are of course keeping their arguments for court as they have to, but what little comment they have made has been less than compelling to me. The idea that their manufacturing processes are in fact posted on their websites and so all you have to do is search the internet, locate their webpage, identify the videos you want to watch, stream those and then make you own mind up if it is indeed handmade as the bottle says. When am I supposed to do this? In the liquor store? Clearly Beam’s lawyers don’t have T Mobile data services. While I have seen some quite visceral reactions to the lawyers who are bringing the class action suit, I have not seen that many leap to the industry’s defence. With one exception… www.bourbonguy.com penned a very spirited defence on April 7th (free joke there – enjoy) that making bourbon is indeed a craft because so much of it happens away from the manufacturing plant (yup I said it) and the real magic happens in the barrel and in the blending. I agree this is a great argument. I think this is what makes bourbon (and other whiskies) so special. I believe I could, with a few hours training, operate a still but I could not make a batch of Knob Creek (although there are times I have thought whoever blends Basil Haydens could use a few more hours of schooling). Based on this logic however I think Tito of Tito’s vodka (also being sued as they claim to be handcrafted) might want to pour himself a stiff drink because they don’t have that argument. Going straight from “still to bottle” is not a good look for this case. I understand all of this because I have invested time and money to learn about whiskey but I am not so sure the judge will see it the same way. Huge production sites with shiny stainless steel equipment everywhere and scale that simply does not scream “craft” to the layman. I also think massive sales volumes for products like Makers Mark won’t help either. I worked in enough oil and gas facilities to know there is nothing in a distillery that you could not walk into any of the Texas City petrochemical plants and find and I seriously doubt I could get away with selling hand crafted gasoline to hipster car owners. To use another metaphor, for me the problem is Beam have been found next to the body with a gun in their hand and a bad case of amnesia and despite whatever actually happened it really doesn’t look good. There has been some abuse of labelling without a doubt and I fear that some of the “good guys” will be on the wrong side of this decision at the end of the day. Perhaps it is time for Beam to accept a deal from the DA’s office? If it turns out the judge does dismiss the law suit then be on the lookout for Seaton’s Handcrafted in Texas Gasoline coming to a gas station near you soon. As I mentioned in my last blog entry, (The End of the Road?) I had reached a point where I was not sure what my next whisky related move would be. When I started the website in 2011 I had set some goals and by late 2014 I had basically met them and my website was less active than JaDaveon Clowney. Excuse me while I pick myself up off the floor after that brilliant joke and remind you all that JD Clowney was the Houston Texans first pick, and first pick overall in 2015 NFL draft, but that he contributed literally nothing during his first season and has so far spent his entire professional career injured and inactive. I told you it was a brilliant joke. Back to the whisky and so my solution was simply to back off a little, try not to worry about it, rework the website over a little and await inspiration. In hindsight this is clearly a strategy I have learned from observing the whisky industry and the fail safe marketing tactic for all tired brands; rework the packaging. If you are reading this blog entry then the website update has now happened (unless you are reading this over my shoulder while I type it on a flight back to Houston which makes you a little scary so please stop). Rather remarkably fate did choose to intervene and while performing my website surgery I have been offered a new job this summer based in Singapore. As my constant typos, errors, inaccuracies and lack of palate consistency clearly demonstrate I am no writer (despite my brilliant Clowney joke above!) and have to find other ways to sustain my family and my expensive drinking habit. From September 2015 I will do that based in South East Asia. This move presents me with an astonishing opportunity and exposure to a whole new whisky scene that will include, but not be limited to, the brands and expressions only available in Asia, new bars and whisky events in a new city, other bloggers to meet and lots of travel retail opportunities. I also hope to work in trips to Japan and Taiwan (and perhaps India) so I can annoy distillery tour guides with my note taking and ridiculous questions on the other side of the world! In short not only does my website get refreshed but in a few months but my whole exposure to the world whisky will be refreshed and a whole new series of opportunities present themselves. Between now I then I promise to use the coming months to iron out the remaining kinks in the website, work through the long list of typos (or as I frequently joke “tpyos”) and other corrections I have noted but never got around to fixing and of course will post some new tasting notes. If you read this and are based in Singapore please feel free to reach out to me and I will be happy to buy you a dram and explain the NFL, Houston Texans, the 2015 draft and the joke above. I promise you it will be worth it.